During the Fall 2014 semester, I determined that it was time for me to kick the nasty habit I had of drinking a minimum 44 oz. of soda per day. After recently viewing the movie “We’re the Millers,” I was determined to find a mug similar to the one possessed by Nick Offerman in the movie, as a tool for drinking more water and/or using as a weapon. I perused the shelves of multiple stores, but finally Academy was the store that satisfied my needs. It was there that I discovered my personal golden chalice, the bubba. The company makes many different kinds of liquid drinking devices, from mugs to jugs and many in between. But my eye fell upon the 52 oz. bubba mug. Now instead of actually being gold, mine is navy blue, and this particular model comes in six other colors as well. Its 52 oz. frame, with a screw-on lid and a cover that snaps closed to prevent spilling, can hold any type of liquid. This includes coffee in such large amounts that it’s dangerous to the human body and such copious amounts of freshly squeezed juice that it threatens the extinction of fruits and vegetables everywhere. 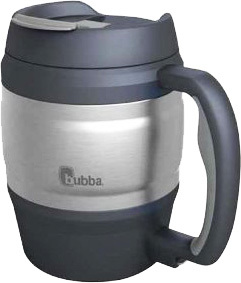 With the bubba already in my house, I can simply fill it with any liquid immediately available to me, and it will satisfy me for hours on end. Another plus side of the bubba is its insulation. With a few pieces of ice, it can keep a mug-full of water cold for up to 10 hours. The downsides to the bubba are its enormous size, combined with its unstable bottom. If it is not on a steady surface, it will fall over easily, and since it is too large for any cup-holder that has ever been made, it rolls around constantly during car rides. Ultimately, due to my lack of self-control, I could not kick the soda habit. In fact, I am consuming a delicious can of it as I write this very review. However, thanks to the bubba, I also drink a significantly larger amount of water than before.